‘Production rose by 0.3% between October and November. Within production mining and quarrying rose by 8.7%’. Both statements are factually correct. But this is very far from an accurate presentation of the data. Economic data provide the main navigation data for conducting economic policy. The ONS’ reporting of the latest production data invites us to admire the view while we are heading for the rocks. The index of industrial production (IP) for November rose to 97.3 in November, from 97.1 in October. In September it was 97.9. 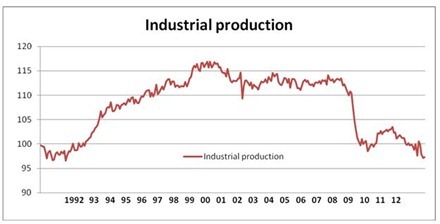 The chart below shows the index of industrial production from 1992 to the most recent data. The base date for measuring output is 2009 when the IP was set at 100. This means that in each of the last 3 months, industrial production has been below the level seen in 2009, which was the deepest recession in Britain since the 1930s. Prior to George Osborne’s Comprehensive Spending Review in October 2010 the IP index for in the 2nd quarter of 2010 stood at 102.7. In the following Budget he promised a ‘march of the makers’. Yet economic policy has overseen a complete reversal of the modest rebound in activity under Labour after it adopted a stimulus programme. Output has fallen by 5.3% from the 2nd quarter of 2010 and is now 1.8% below the low-point recorded in the recession. The startling fact is that, as the chart shows the last time industrial production was lower than the most recent reading was in May 1992. According the National Institute of Economic and Social Research GDP shrank by 0.3% in the final quarter of 2012. There will be much discussion about the unprecedented ‘triple-dip’ recession that the Tory-led Coalition has presided over. The criticism is entirely justified. But the medium-term picture is even more grave. The British economy has slumped to levels of output last seen 20 years ago, at the depth of the ERM crisis. That too was another failed Tory experiment in the necessary ‘disciplines’ to curb wage growth and so restore profits. This is a chronic failure of economic policy. A radical reorientation is required to halt the crisis. This entry was posted in Economics, Globalisation, Topical News and tagged EMR crisis, GDP, Index of Industrial Production, Industrial production, Michael Burke, ONS, Osbornomics, Socialist economic bulletin by syzygysue. Bookmark the permalink.